FRANKFURT, Germany — European businesses are unsettled as they watch the U.S. and China collide over trade. And for good reason: the nascent global trade war could represent the biggest single threat to the economic upswing that has helped the region get past its financial crisis. And that's just what's happening in Europe. By one measure, business confidence has fallen in six of the past seven months in Germany, where exports are almost half of annual economic output. "It's worth all our efforts to defuse this conflict, so it doesn't become a war," German Chancellor Angela Merkel said Wednesday. The head of the EU's executive, Jean-Claude Juncker, will head to Washington in late July to try to personally persuade Trump against further measures targeting Europe. The disputes over trade threaten to spoil the good times for Europe's economy. "Trade tensions stoked by U.S. President Donald Trump are clouding the economic outlook in Europe," wrote analysts at Berenberg bank in London. They rated the trade risk ahead of troubles from Italy's heavy debt load or faster than expected interest rate increases from the U.S. Federal Reserve. Many European companies would suffer because they both produce and sell goods in the U.S. and China, the world's biggest economies. Daimler has already lowered its outlook for profits, citing higher than expected costs from the new tariffs. BMW warned in a letter to Commerce Secretary Wilbur Ross on Friday that tariffs would make it harder for it to sell in China the vehicles it builds at its factory in Spartanburg, South Carolina, "potentially leading to a strongly reduced export volumes and negative effects on investment and employment in the United States." By themselves, the tariffs that take effect Friday won't immediately have a dramatic impact on global trade. The fear is that retaliation will spiral, hitting the total amount of global commerce. Even if the overall effect is to harm growth, there could be benefits for some European companies and sectors. Economists Alicia Garcia Herrero and Jianwei Xu at the French bank Natixis say that European makers of cars, aircraft, chemicals, computer chips and factory machinery could in theory snare market share by substituting for Chinese or American products in the two markets. But that's only if Europe's own trade dispute with the U.S. does not escalate — a big if. Europe is waiting to see whether the Trump administration will go ahead separately with tariffs on auto imports. European companies like BMW, Daimler's Mercedes-Benz, Volkswagen's Porsche and Audi divisions, and Fiat Chrysler send $46.6 billion worth of vehicles every year to the U.S. Some 13.3 million people, or 6.1 percent of the employed population of the EU, work in the automotive sector, according to the European Automobile Manufacturers Association. "Europe cannot win anything" on an overall basis "for one obvious reason: we are net exporters," said Garcia Herrero, chief economist for Asia Pacific at Natixis and a senior fellow at European research institute Bruegel. "But we should not understate the view that some sectors could get something out of a U.S.-China trade war." "If China concedes to the U.S. proposed agreement, the whole situation faced by the EU would be much tougher," she and Xu wrote in a research note. 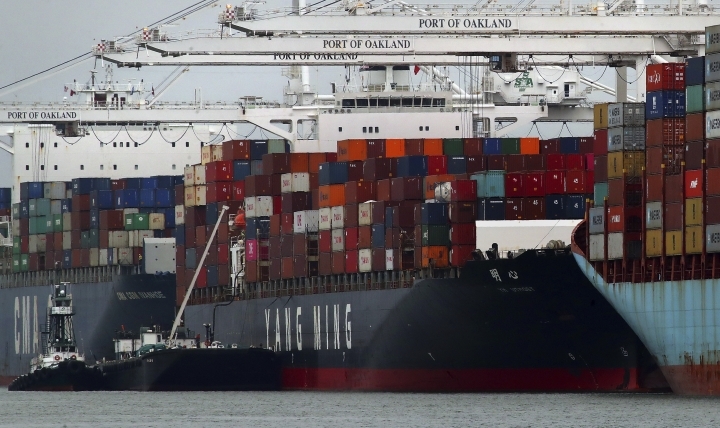 "For China to massively reduce its trade surplus with the U.S., it has to in some way substitute its imports away from the EU to the U.S., which would have a significant negative impact on the EU producers."